<a href="https://www.modernspacesnyc.com/wp-content/uploads/2015/09/30-55-Vernon-Boulevard-Setup-Web1.pdf">30-55 Vernon Boulevard Setup Web</a> Modern Spaces is excited to announce that we have been retained on an exclusive basis to arrange for the sale of 30-55 Vernon Boulevard. The offering is an assemblage of four tax lots on the Astoria waterfront. The properties are located immediately south of the Hallet’s Point and Astoria Cove megaprojects. The Assemblage: Comprised of tax lots 14, 24, 25 and 26 on block 505, the offering has a total lot size of 37,646 square feet and over 540’ of street frontage. With a current zoning designation of C1-3/R7A on the western portion of the property and R5B on the eastern portion, a developer has an as-of-right buildable square footage of 129,870 for mixed-use development. Alternatively, it is possible for a developer to have the eastern R5B portion of the assemblage re-zoned to R6B, allowing for a buildable square footage of 158,656 for mixed-use development. 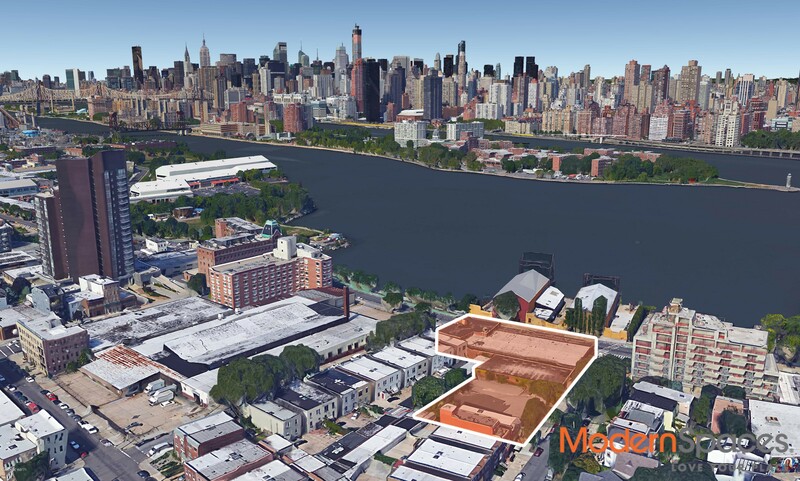 The Location: The properties are located directly across Vernon Boulevard from the East River. Such a location offers excellent views of Manhattan and access to multiple waterfront parks in the immediate area, including Socrates Sculpture Park, Goodwill Park and Rainey Park. This waterfront locale is currently undergoing a large revitalization, with hundreds of units in multiple small to medium luxury and market rate buildings planned, under construction and recently completed. In addition to the swath of development on the waterfront and the immediate in-land blocks, two large megaprojects will drastically revolutionize the neighborhood. Hallet’s Point &amp; Astoria Cove are two fully approved projects that will bring approximately 4,100 housing units, retail space, a supermarket, and a school to the immediate vicinity. In addition, the project will also include the construction of a waterfront promenade leading to a new east river ferry terminal. This promenade will have an entrance across the Vernon Boulevard from the subject offering. The Value: Demand for luxury residential and local retail space continues to be at record levels. Local new-construction residential rental values have topped $50 per square foot for rentals.